19.04.2017. THE BMW GROUP at the AUTO SHANGHAI 2017. The new BMW i8 Frozen Yellow Edition (01/2017). BMW GROUP at the AUTO SHANGHAI 2017. Shanghai. Wednesday, 19. April 2017. Here you will see the transmission of the BMW Group press conference. The world premiere of the all-new BMW 5 Series Long Wheelbase is one of the main highlights of the Auto Shanghai 2017 show. The new business sedan is the successor to the current front-runner in the Chinese car market’s premium segment and comes with all the right credentials for cementing this leading status. Likewise making its debut public appearance is the latest special-edition version of the BMW i8 plug-in hybrid sports car. And Auto Shanghai 2017 also hosts the Asian premieres of the BMW Concept X2, revised BMW 4 Series models and new services from BMW Connected created specifically for the Chinese market. The time-honoured MINI brand is also represented at Auto Shanghai 2017 with a world premiere. The new MINI John Cooper Works Countryman, a talented all-rounder with stand-out performance attributes, is making its first public appearance. And BMW Motorrad is kicking off its 2017 product offensive with the presentation of the revised BMW S 1000 RR and BMW S 1000 XR, plus an ultra-exclusive new model. Auto Shanghai is one of the most important motor shows of the year for the global automotive industry. It has taken place every other year since 1985, alternating with the Auto China show in Beijing on the motoring calendar. The National Exhibition and Convention Center in the west of Shanghai opened its doors in 2015 and invites vehicle manufacturers, suppliers and service providers from around the world to display their products across an area measuring some 400,000 square metres. The 17th edition of the Auto Shanghai show will see more than 1,100 exhibitors present their new models, technological innovations and service offerings to the public from 21 – 28 April 2017. World premiere: the all-new BMW 5 Series Long Wheelbase. Taking centre stage at the BMW brand’s stand at Auto Shanghai 2017 is the world premiere of the all-new BMW 5 Series Long Wheelbase. The new model is being built by BMW Brilliance Automotive Ltd. exclusively for the Chinese market at the Shenyang facility. Its 133-millimetre-longer wheelbase imbues the business sedan’s exterior with elegantly stretched proportions which blend harmoniously into its contemporary looks. State-of-the-art powertrain and chassis technology underpin an exceptional balance between BMW’s hallmark dynamic driving ability and supreme ride comfort. The all-new BMW 5 Series Long Wheelbase is up to 130 kilograms lighter than its predecessor and boasts enhanced aerodynamics. Generous kneeroom, optimised soundproofing and a host of innovative equipment features – such as the electrically adjustable comfort seats, Ambient Air package and Sky Lounge Panorama glass roof – elevate on-board comfort in the rear to an even higher level. As well as the iDrive system and a further improved voice control system, the display and control concept also encompasses a touchscreen monitor and BMW gesture control. 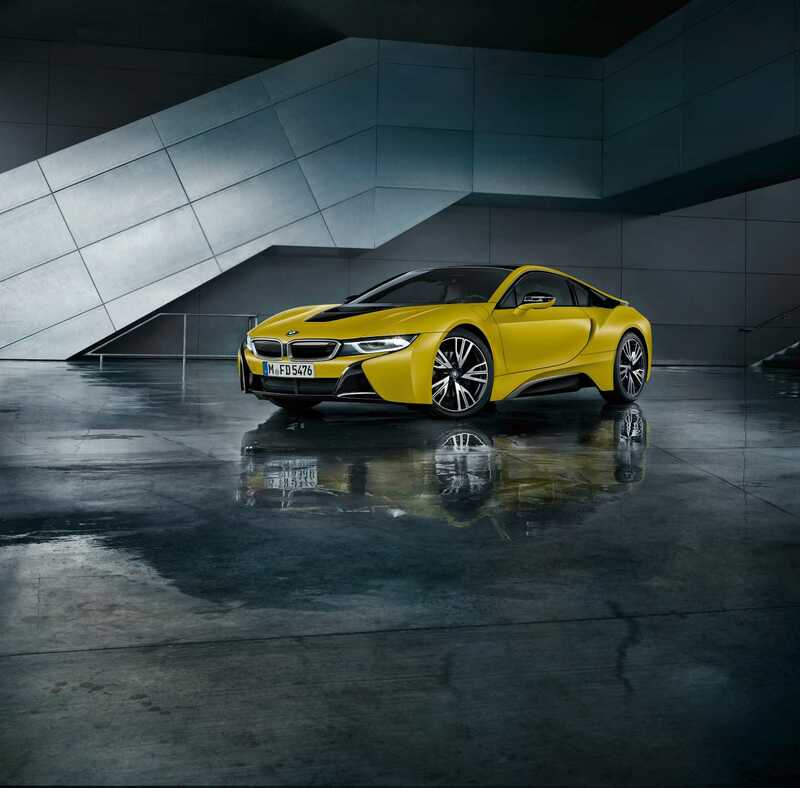 World premiere: the BMW i8 Protonic Frozen Yellow Edition. The BMW Group is also building on its successful track record in sustainable mobility, where BMW i has played a significant role. The BMW eDrive drive system technology originally developed for the all-electric BMW i3 and BMW i8 plug-in hybrid sports car can now be experienced in six BMW model ranges and one MINI. Indeed, fuelled by the popularity of the BMW i and BMW iPerformance models, the BMW Group is now the most successful manufacturer of plug-in hybrid models for the premium segment globally. 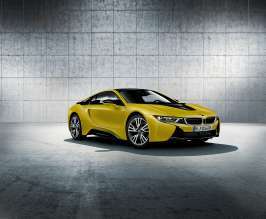 The BMW i8, for example, has developed into the world’s highest-selling plug-in hybrid sports car. And its appeal is given fresh lustre at Auto Shanghai 2017 with the presentation for the first time of the BMW i8 Protonic Frozen Yellow Edition. This latest special edition stands out with its exclusive Protonic Frozen Yellow paint finish, newly designed 20-inch light-alloy wheels and distinctive interior design cues. Asian premiere: the BMW Concept X2. The BMW Concept X2 is celebrating its Asian premiere in Shanghai. The new vehicle concept for the premium compact segment combines the robust and functionally accomplished character of a BMW X model with the low-slung proportions of a coupe. Among the signature X elements are muscular surfaces, large, almost squared-off wheel arches and stylistic underfloor protection. The long wheelbase, short overhangs, flowing roofline and slim side window graphic lend the silhouette of the BMW Concept X2 a svelte and dynamic appearance. Asian premiere: the new BMW 4 Series model range. The new BMW 4 Series models will be introduced to the public in Asia for the first time with detailed revisions to their design and optimised chassis technology. LED headlights and LED rear lights now come as standard for the BMW 4 Series Coupe, BMW 4 Series Convertible and BMW 4 Series Gran Coupe, as does a refined premium ambience in the interior. If the optional Navigation system Professional is specified, the iDrive operating system also features a new tile-style menu layout with constantly updated content. And the Multifunctional Instrument Display can now also be ordered as an option. BMW Connected with services developed specially for China. With mobility, communication and infotainment services tailored specially to BMW’s Chinese target group, BMW Connected presents a premium digital offering unmatched in the country. The BMW Connected personalised mobility assistant’s China-specific functionality includes customer support among its suite of services. BMW Connected allows smartphone users to coordinate communications with a selected BMW dealer and arrange service appointments. BMW Connected also supplies users in China with information on traffic offences. And customers can make use of online-based lifestyle, social media and entertainment services selected specially for the Chinese market and with bespoke functionality. World premiere: the new MINI John Cooper Works Countryman. The MINI brand is showing off its sporty side at Auto Shanghai 2017, with the world premiere of the new MINI John Cooper Works Countryman commanding the limelight. The latest John Cooper Works machine is the largest and most versatile elite performance model in the British car maker’s portfolio. The brand’s most powerful engine, eight-speed Steptronic Sport transmission (fitted as standard in cars for the Chinese market), ALL4 all-wheel drive and sports suspension, plus the aerodynamically optimised body and sports-car cockpit aura come together into a sublime overall package to deliver standout performance and a race feeling that will capture the imagination. The new-generation MINI sees the British manufacturer also strengthening its position as the leading maker of premium vehicles in the small car and compact segments in China. The MINI 3-door and MINI 5-door are each available with a selection of three engines in the country, and MINI Convertible customers there can choose from two variants. In the premium compact segment, the MINI Clubman can be ordered with one of three engines and the MINI Countryman with a choice of two, plus ALL4 all-wheel drive as an option. The new MINI John Cooper Works Countryman joins the MINI John Cooper Works and MINI John Cooper Works Clubman in the ranks of top-level MINI performance models in China. BMW Motorrad: fresh success, a model offensive and a world premiere for a suitably exclusive newcomer. BMW Motorrad recorded extremely dynamic growth in China in 2016, with sales up 52.7 per cent compared with the previous year. And the brand is continuing along its upward curve in 2017, fuelled by its ongoing model offensive in the premium motorcycle and maxi scooter markets. 14 new and redesigned models are set to be introduced up to the end of 2017. And the brand is showing various models at Auto Shanghai 2017, including the latest versions of the ultra-sporty BMW S 1000 RR and BMW S 1000 XR. But the highlight of the BMW Motorrad stand is the world premiere of one of the most exclusive models ever offered by BMW Motorrad.